1 + 2 = 3 is the simple concept which stands behind GC's Featherlite 3 frames. 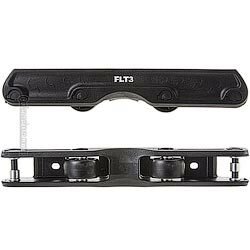 The FLT-3 combines the metal axle spacers of the FLT-1 with the unmatched grinding feel, light weight and strength of the FLT-2 frame. Even with the axle bolts tightened all the way the wheels are still spinning freely and everyone on our team was blown away what a difference it makes and how much faster these frames are. GROUND CONTROL BARCELONA.2 from Ground Control on Vimeo.